← Do the arts affect your daily life? A few months ago, I mentioned in a previous blog essay that I had the opportunity to “fill in” for a presentation (Armenian History through Music) that took place at Wayne State University, part of several ongoing events commemorating the Armenian Genocide. The program discussed how Armenian music is important to our history and how it related to Genocide. Here I am talking to the audience at Wayne State University this past April. 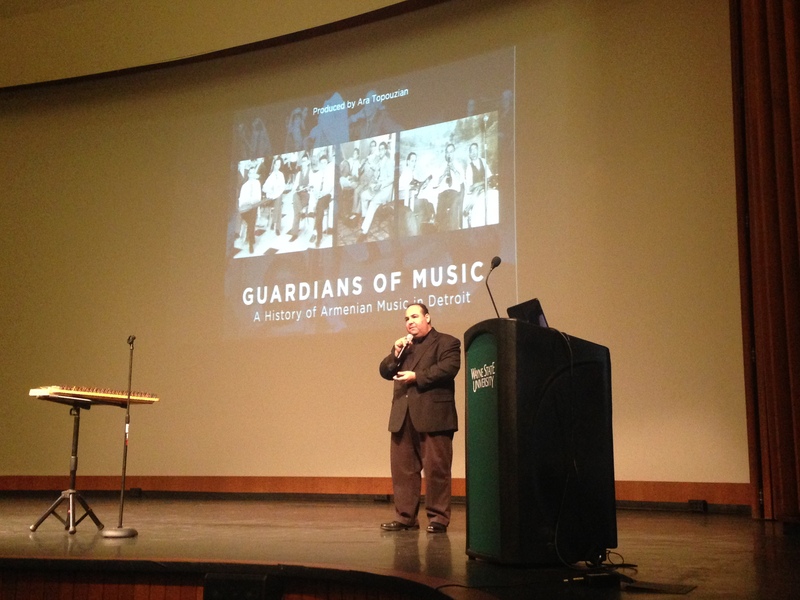 My presentation covered some of the highlights of the making of Guardians of Music. It was the first time I had talked about the documentary post airing on PBS. Oddly enough, it seemed different for me this time. I have talked about the making of this film several times, but now as it was post-premiere, the tone for me seemed different. It was more personal and even emotional. My presentation included photos used in the documentary and for the first time, I found myself referring to them differently as I did prior to the airing of the film. Enough time had passed for me to fully realize what kind of an impact this documentary made on the community and its relevance to the Armenian Genocide anniversary. Please don’t misunderstand me, this isn’t ego talking, as a matter of fact, I think I have stated before that I was unsure if my documentary would be perceived favorably or not. What I found myself doing was referencing the photographs differently from the past. Instead of simply mentioned musician names and their style or brand of playing — I talked about what I knew of them as a family man and what their backgrounds were in historic Armenia. I talked for sometime about how they never realized the importance their playing made within the Detroit community. How they preservation of music was instrumental (pardon the pun) and how they need to be remembered and in many cases – revered. How 100 years later, their music is still heard. I hope the afterlife of Guardians of Music lasts a long time. These musicians and their contribution should live forever. This entry was posted in Uncategorized and tagged 100 Years, Armenian, armenian genocide, detroit, documentary, photographs, wayne state university. Bookmark the permalink.